Our choice for Quote of the Week was inspired by the recent opening of the National Memorial for Peace and Justice in Montgomery, Alabama. A memorial dedicated to the legacy of black lynchings, terror, and discrimination in the United States, it forces us to remember the importance of justice and the unbearable cost of injustice. 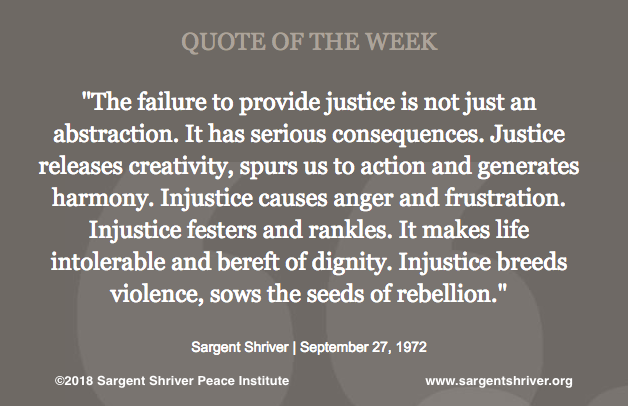 An attorney by profession, Sargent Shriver believed that justice and peace were inextricably linked. In public addresses about the law, he often made the point that without justice we could not achieve true peace. And as he articulates in this week's speech, "Justice -- A New Vision," justice has the potential to unleash creativity, positive action, and to foster harmony. It is interesting to note that Sarge delivered this speech while on the campaign trail as candidate for Vice President, running on the McGovern ticket in 1972. While the campaign was ultimately unsuccessful, we admire its principled message of peace and justice, during a time of conflict and upheaval for the United States.